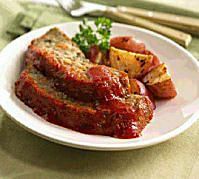 This meat-free "meat" loaf is made with store-bought vegetarian ground beef substitute. GimmeLean works best. You'll find it in the refrigerated produce section in most large supermarkets. Like cooking with meat substitutes? Here's a few more meat-free meat substitutes for vegetarians. Preheat the oven to 375 degrees and lightly grease or spray a 8 x 5 loaf pan with non-stick spray. Place the bread in a bowl. Cover with hot tap water. Let it sit for about 5 minutes, then gently squeeze out as much water as possible, then crumble into a dry bowl. Add the vegetarian beef susbtitute, parsley, garlic, onion, carrot, egg, and oil. Season generously with salt and pepper, then mix together. It'll be easiest to use your hands for this. When the ingredients are well mixed, place in to the greased loaf pan. Smooth the top of the loaf then spread the marinara sauce over the top of the loaf. Lightly spray a sheet of foil, then cover the pan, sprayed side down. Bake in the pre-heated oven for about 35 minutes, then remove the foil and bake for another 30 minutes.